Always on the lookout for delicious and palatable new beers, I saw that Stone Ruination IPA was rated in the 100th percentile on RateBeer.com and thought it would make for an enjoyable companion to dinner. This particular bottle was purchased from a local beer & wine shop and set me back $6.99 (plus tax, so $8 total). I chilled it to an appropriate temperature before serving. 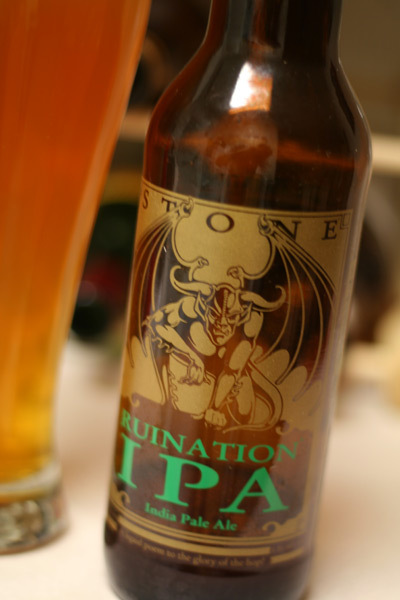 Stone Ruination IPA is advertised as a bitter, extra-hoppy brew with hints of citrus and fruit. Reality, however, never quite meets expectations. This beer was certainly bitter, but at no point did I really enjoy it. Great IPAs are well-balanced, and this one was not (and trust me, I know what to look for in balance). Though Ruination got a bit better as I worked my way through the glass, I was never able to overcome the overpowering sensation of bitterness. Perhaps I got exactly what was advertised: A massive hop monster. If so, then this a monster I will probably be skipping in the future.